June has been relieving businesses of their IT headaches for over 20 years. With a vast experience in services account management, this ensures her team deliver customer focused solutions by always putting the customer first! June specialises in maintenance and managed support contracts along with cost effective solutions for small businesses who wish to improve their IT infrastructure. Lewis joins us on the same apprentice scheme as Adam started out on. He is already cutting his teeth on the implementation of a new call logging system. 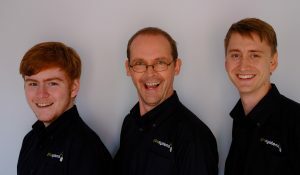 Lewis is charge of logging calls, workshop repairs and building our YOU PC’s. John joined the company in 2011. He has over 12 years experience in the diagnosis and repair of computer equipment in both hardware and software applications. He has a vast knowledge of HP, Dell & Lexmark equipment. He is Microsoft & Cisco certified. Adam joined us at the age of 16 after completing his school work experience with us. He has worked his way up the company from trainee workshop engineer to Technical Director and is now 28. He is responsible for the company’s YOU Care managed support and ensuring that our customers IT runs smoothly. Adam is Microsoft and Tally certified.